While I was away taking care of more import matters, an incident categorized as the Swedish equivalent of the Trent Lott affair has erupted. The background is this. The Swedish government was heavily critized for how it handled the tsunami disaster in Asia in December 2004 when more than 500 Swedes were killed. The main problem in handling the crisis on Dec 26, 2004 was the lack of a working crisis management in the Goverment Offices, according to the Catastrophy Commission. It was therefor Prime Minister Göran Persson who had the overall responsibility for the flaws. Lars Danielsson is the State Secretary and often labelled “Göran Persson’s right hand”. In March 2005, the Catastrophy Commission queried Lars Danielsson who then claimed that he had called the State Secretary for Foreign Affairs, Hans Dahlgren, twice on Dec 26 to inform him of the situation. Dahlgren on the other hand testified to the commission that no such talks had taken place and Danielsson then more or less changed his version. When JO, the Parliamentary Ombudsman, investigated the matter, Danielsson insists that he called Dahlgren twice but cannot remember from which phone. Questions remain, was Danielsson in his office on Dec 26 and who did he call. The government refuses to clear the fog with reference to state security. And as often when a question is left unanswered it leaves the field open for speculations and rumours, and this case was no exception. A rumour among journalists was that Danielsson can’t reveal what he did on the 26th because he was actually with a female companion, a certain Assistant Undersecretary. But no journalists were able to get this rumour confirmed and therefore no articles were written about it. Instead the rumour was discussed on the internet forum Flashback in a thread started on Feb 16, 2006. Peter Wennblad at Neo claims he heard the rumour a week earlier. On Feb 17, two liberal bloggers posted the rumours. Johan Ingerö runs the blog Right Online [dead link] and he was the first blogger to write about the story, followed shortly after by Johanna Nylander. But it wasn’t until last week that the story really exploded in media and the two bloggers found themselves in the middle of a major news event. The rumour was not true. Ingerö was now the main target and he made a complete fool out of himself when he was interviewed on the news. So for the first time in Sweden, bloggers were at the centre of a major crisis, resulting in accusations, spin and counter-spin. Marita Ulvskog, party secretary of the Social Democrats accused bloggers from the Liberal Party of “creating the story”, which apparently was a bit far fetched. Resumé claims today that Social Democrats were trying to get media to blame the liberal bloggers as part of the PR strategy. Ingerö eventually found no other way out of the situation than to pull the plug on his blog (Google cache here). However it didn’t take long until someone kidnapped the URL and launched a parody of Right Online on the same address. Nylander did the right thing and apologized for the damage her blog had caused. Now, what an excellent opportunity for mainstream media to go after the blogosphere. Bloggers posted unconfirmed rumours that later turned out not to be true, while the press held the rumours out of the papers because they couldn’t get a credible source to confirm it. At least that’s what they want us to believe. In reality the tabloids wrote articles that did almost everything except spell it out in writing. Either way, the requests for ethical rules for bloggers now come pouring in. – Bloggers have completely different demands for truth than we do, says Aftonbladet’s managing editor Niklas Silow. You thought that hell would freeze over or that Finland would win the Eurovision Song Contest before you heard tabloid Aftonbladet swing the ethics sword at bloggers, but there you go. – So I don’t believe in blogs as an alternative to established media. But the call for all bloggers to abide to an ethical standard or in general act the way journalists do, is to look at blogs from the wrong angle. Bloggers helped keep the story about Danielsson’s whereabouts alive and it finally last week lead to a decision from Danielsson to take a time out. Had this happened if bloggers hadn’t written about the story? Don’t know. Has the question been answered? Definitely no. Did some bloggers step over the line? Definitely yes. But that does not mean that blogs as a medium don’t work or that we all suddenly are supposed to act as journalists, except without pay. 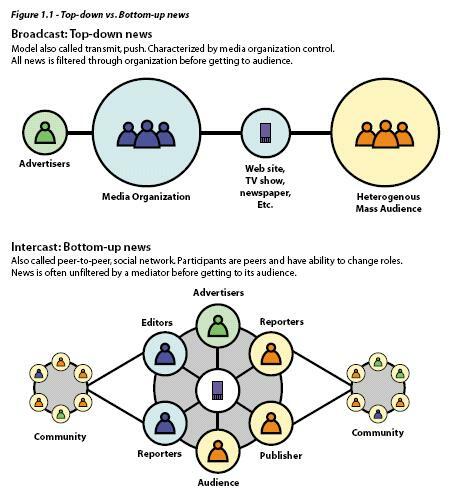 The traditional publishing model for journalism is to filter then publish. The blogosphere works the other way around – publish, then filter. Johan Ingerö who was the first blogger to publish the rumours got humiliated on national tv, his blog has been shut down and I don’t expect to see him running a successful blog in the near future. He got punished for not checking the facts (not my job, he claimed). That’s the way blogs filter fact from fiction and we will have to put up with some crap and lies because the pros outweigh the cons. Naturally there are people who will be hurt by what some bloggers write and there are laws that protect us from the worst cases. I don’t see that a blogger code of ethics will save us from stupidity. It’s not the morons that will sign up for that code anyway. There will be other cases when bloggers make huge mistakes, and others when they contribute to a story. 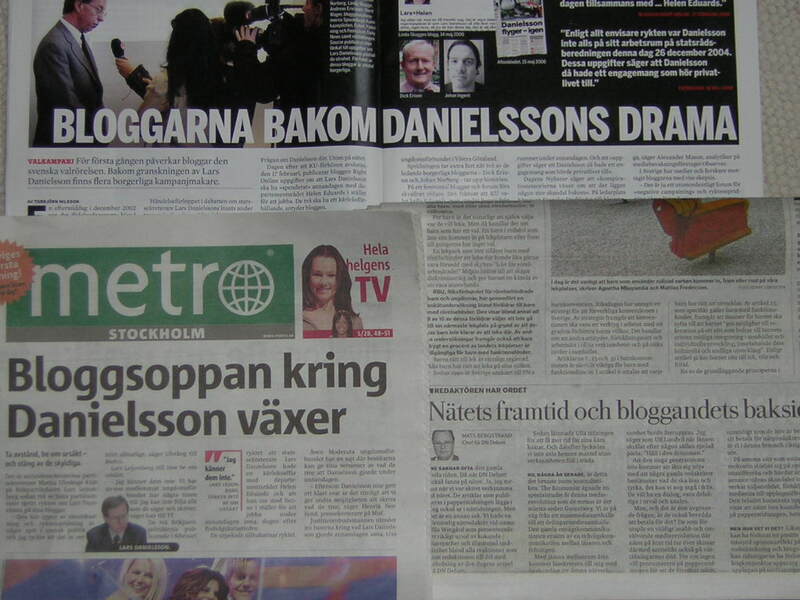 I just hope that the blogosphere can help keep the kettle burning under Danielsson during his time out so that we eventually will get an answer to what he did on Dec 26, 2004.